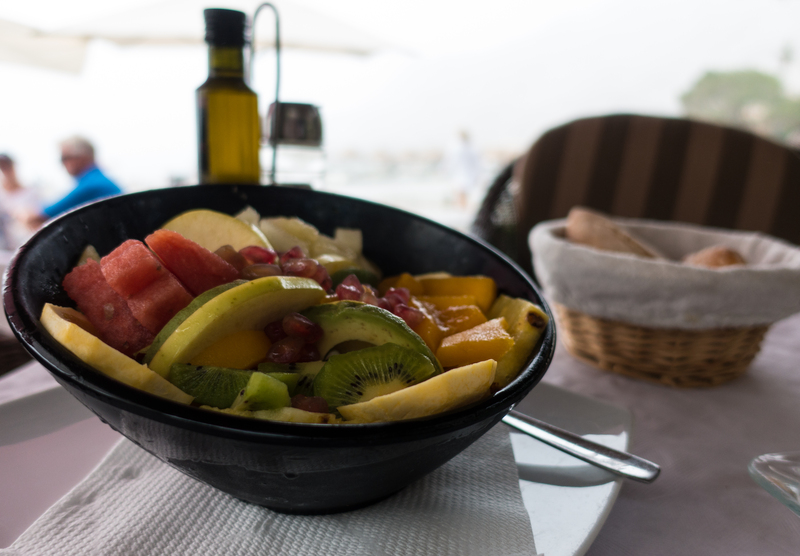 This is a ubiquitous dish in the beach bars of Spain’s Costa Tropical, using locally grown exotic fruits. It’s a lovely refreshing starter which can also be quite substantial, while providing a large contribution to your five a day. We usually share one between two of us before a platter of grilled fish. I will confess to not being a fan of conventional fruit salad: a variety of soggy fruits swimming in sickly sweet liquid does not float my boat. Bananas are especially loathsome in this context. But ensalada tropical is completely different: the dressing adds a welcome acidity that complements the fruit beautifully. The recipe allows for considerable variation. The essentials are crisp lettuce, some kind of citrus, and something crunchy (although apple is not tropical, I think a few slices add the necessary texture). You won’t go far wrong by including mango, avocado and pineapple, in fact I think it’s incomplete without at least two of these. Melon in some form is good, and a few slices of kiwi fruit are attractive. We added persimmon to our last one, and that worked well too. I think passion fruit would be a lovely addition. Other than that, use what you like and is available (although I have to say I have never seen one featuring bananas, thank goodness). We also toss in some of the handy fruit and seed mix sold as “salad mixture” in Spanish supermarkets (I always stock up on it when there). 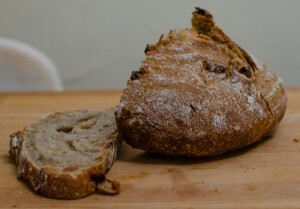 This usually features raisins, chopped walnuts, sunflower seeds, and maybe some chopped roasted hazelnuts. This isn’t really hummus, because it doesn’t have oil or tahini in it. But if you’re trying to cut down on fat intake, it’s not a bad substitute, and it is very quick and easy to make using a jar of chickpeas and a few other ingredients you’re likely to have on hand. It’s part of our campaign for healthier nibbles to eat with aperos; we have it with raw carrot sticks, but you can use other vehicles of your choice, including pitta bread of course. Use a Spanish brand of chickpeas if you possibly can, they are just better. Jars are generally better than cans for some reason. Lack of tahini and oil means you have to really ramp up the spices and garlic to stop it being bland. Don’t take my quantities as gospel — taste and adjust as you like. This makes a lot; I hope it freezes well because that’s what I’ve done with half of it. It will keep for a few days in the fridge. When in Spain … it has to be arroz con leche, not plain old rice pudding. Truth to tell, the two are almost identical. In Spain, the arroz is always served cold, with a generous sprinkling of cinnamon, one of the three spices used in unadventurous Spain (the others are saffron and paprika). And of course the rice used is paella rice (bomba), subtly different from the round-grain Carolina rice we use. Many Spanish recipes specify partly cooking the rice in water and then adding it to the milk, but I don’t hold with that — I like my pudding thick and creamy, and you need all the starch in the rice for that. TV chef Karlos Arguiñano’s recipe suits me; he cooks it in milk, and the only thing I changed was the amount of sugar (many Spanish dishes are over-sweet for my taste) — plus we had it hot.